Owner Of 'What To Eat' Owes F&B Partners "Hundreds Of Thousands"
Owner Of 'What To Eat' At The Brink Of Bankruptcy - Owes F&B Partners "Hundreds Of Thousands"
A local food delivery company went “uncontactable” after failing to pay F&B merchants for money owed to them. 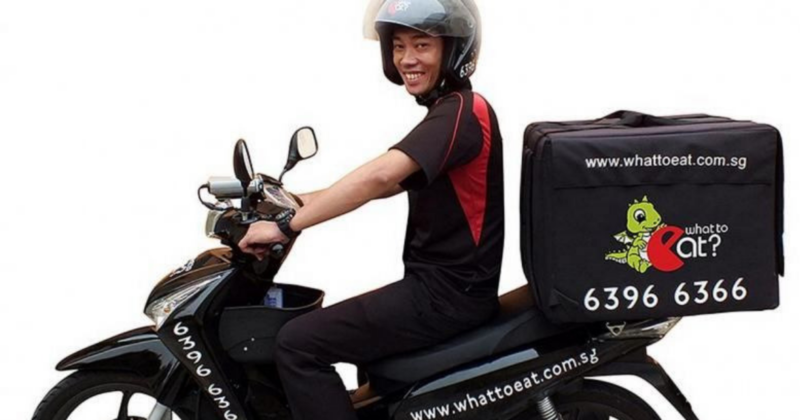 What To Eat was founded in 2013 and was described by The Straits Times (ST) as one of the first food delivery services to gain traction in Singapore, together with Foodpanda and Deliveroo. The owner, 40-year-old Benson Lo, had seemingly disappeared when a reporter tried to reach out to him at his Whampoa home and Geylang office on Tuesday, 13 November. Anthony Fok, owner of the Little Gobbles Cafe told ST that he had stopped receiving payments from What To Eat since signing up with them in March. He had honoured all the orders worth about $50 to $100 each until this month, and claimed that his business was “owed thousands of dollars”. Another F&B owner interviewed by ST also faced a similar plight. Vegan restaurant nomVnom owner, Ng Wai Lek, told the reporter he is owed about $4,000 with the last payment made in September, and revealed that What To Eat started “delaying payments two years ago”. Ng had filed a case with the Small Claims Tribunal but said that Lo didn’t appear. Other restaurant owners, such as Joseph Lim of The Garden Slug, told Channel NewsAsia (CNA) that he was “owed at least $700”. Payments to The Garden Slug halted in February and the last time Lim got a response from Lo was in August. A Mr Lau from Annabella Patisserie shared with CNA that What To Eat owed the confectionary $1,000. According to ST, in the past four months, customers have complained about getting charged for meals that never reached them and for failing to get refunds. A police report was made and a complaint was lodged at the Consumers Association of Singapore (CASE) against What To Eat. Business owners were understandably miffed at Lo’s disappearance and some of them had tried to look him up at the office in the past four weeks. However, two weeks ago, Lo had upped and left the space, a security guard told ST. Taking matters into his own hands, one hawker stall shareholder told CNA he went to look for Lo personally at a coffee shop he thought was managed by him, and managed to get back the $1,000 he was owed. For Mr Lau, he’s more concerned that merchants like himself will lose their reputation in the eyes of customers who pay but don’t receive their products. While other establishments are seeking ways to get repayment, Mr Lau took the high road, preferring not to approach the authorities and writing off the $1,000 debt. He believes Lo’s company has “run into financial problems and is ‘not running away'”. Still, affected F&B partners like KA have lamented that Lo should “at least let [them] know and not avoid [them]” if he is truly facing financial difficulties. “It’s not just about the money but also the integrity and trust of businesses here,” Fok told ST. In a 2016 interview with ST, Lo said that business at that time was good, and they had “the widest variety of food options delivered island-wide”. He also stated that What To Eat used to partner Foodpanda but later split, citing “business differences”. On Thursday, 15 November, CNA managed to locate a “weary-looking” Lo at the same coffee shop KA went to, where he has rented a stall to earn an income to support his family. Lo thinks he could have a total debt going into the hundreds of thousands of dollars, explaining that “poor business, high overheads and stiff competition” was what drove his company to the ground. Selling all of his personal possessions and making a living working at the coffee shop, Lo said he prioritises paying off staff salaries and clearing his larger debts. “I’m really at the stage where I’ve given up everything,” Lo told CNA. He is also planning to declare his company bankrupt adding that he will leave it to the bankruptcy process if his partners want to sue his company. Even though What To Eat “showed promise” as it launched with 100 over F&B partners back then, CNA wrote, Lo said his company started losing customers as competitors like Foodpanda get fundings from investors. An attempt to enter the Malaysia market failed and the company burned out badly. It was only when he noticed that What To Eat hasn’t paid a single company for the past one and a half years, did he realise that he was in hot waters. In total, he owed them about $100,000. He is in the dark about how it happened, vaguely saying that it “could be due to accounting issues with either party”. Lo explained that he was “aggressively” harassed by debt collectors and loan sharks at work and at home. To settle the problem, he told CNA that he was forced to dip into funds set aside for “other establishments”. The father-of-three regrets not closing down earlier, as he felt that he was responsible for the livelihoods of his employees who were mostly foreigners.